I've been reading about it. The new formula for Kraft's Macaroni and Cheese Dinner that is. I've just discovered that Kraft has released the new formula, which is dye free, for this very popular processed food product with this package of mac and cheese that features noodles in Star Wars shapes. That release, of course, set to take advantage of what promises to be a really big year for the Star Wars franchise. Kraft says that it is made with no artificial flavors, preservatives, or synthetic colors. Testers at Huffington Post say the product looks slightly different than it did before and to be honest, it does not matter to me what it looks like. More importantly, many testers could detect no difference in taste when presented with two different recipes saying things like, "I really liked both and couldn't really tell a difference." I am curious about what this product TASTES like and will be watching for it at the grocery store. You? If you are curious, too and cannot find it at your local grocery store, you can order Star Wars Kraft Dinner directly from Amazon by clicking here. 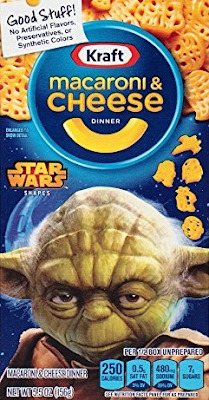 Buy Kraft Macaroni and Cheese Star Wars shapes from Amazon by clicking right here. Follow my Pinterest board, Fun Food, by clicking here.